What father would not want to be called their children's hero! This would be the best Father's Day present a father could ask for. 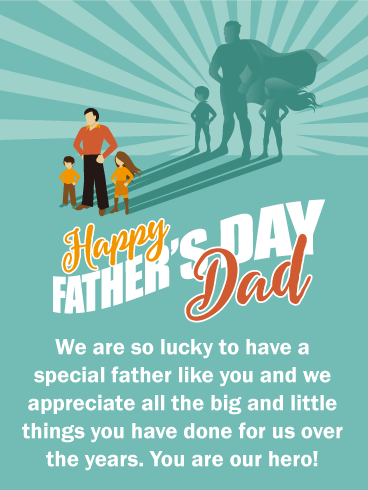 If both of you want to make your father happy, send this super Father's Day card to him today! It features a fun image of a father with two children and a superhero shadow behind them. 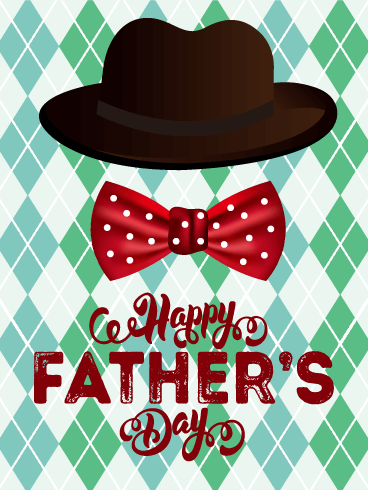 Let him know you feel lucky to have him by sending this Father's Day card out super fast! HAPPY FATHER'D DAY Dad - We are so lucky to have a special father like you and we appreciate all the big and little things you have done for us over the years. You are our hero! If you're looking for a sentimental Father's Day card that your husband will love, this is it! 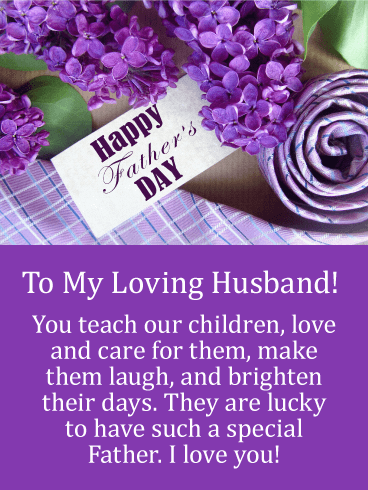 This Father's Day card explains that your husband teaches, loves, and cares for your children. These elements are important when raising children and this Father's Day card expresses it well. 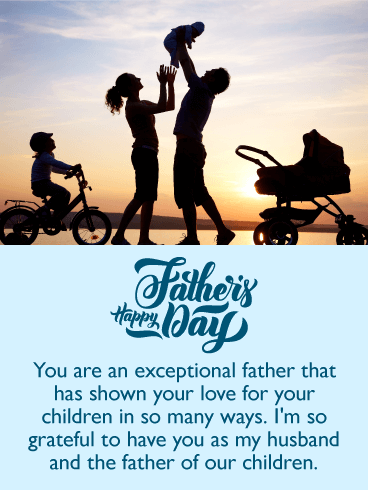 As his wife, he will be happy that you appreciate what he does for your children, and that you sent him such a special Father's Day card. Let your husband know that you cherish him and the family you created together with this loving Father's Day card. It features an image of a family spending time together, and the words Happy Father's Day with hearts displayed nearby. 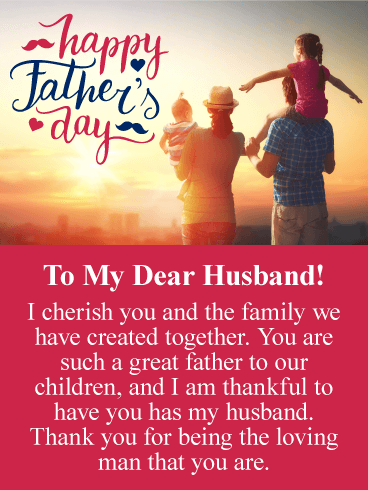 This Father's Day card tells your husband that his wife feels he is a great father to his children, and it thanks him for being a loving man. Send this special Father's Day card today! If the two of you know that someone has raised their children well and that they are a fantastic father, should you let them know? Absolutely! 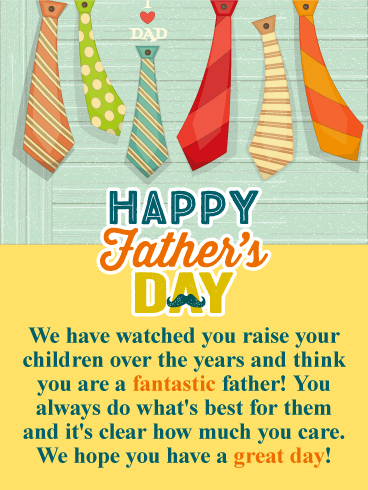 This can be accomplished by sending this thoughtful Father's Day card that lets him know both of you realize that he does what is best for his children! Wish him a great Father's Day from both of you, it will add some happiness to this special holiday that honors him! 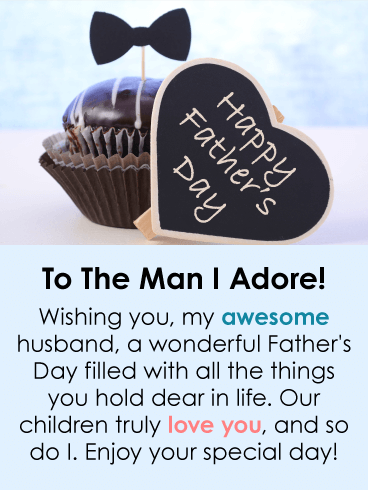 If your husband loves deserts, then he is going to really like this Father's Day card that features a mini chocolate cupcake! He will also love the heart that displays the words Happy Father's Day. Best of all, this Father's Day card expresses that he is a wonderful father that is truly loved by his children. 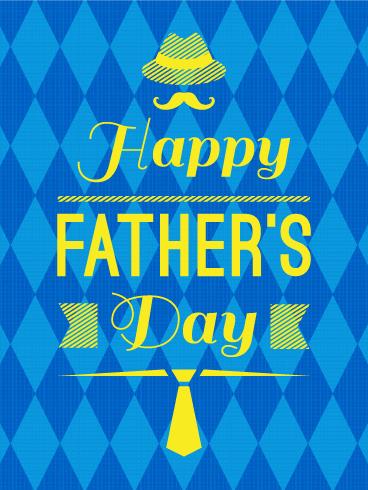 On this special day, tell him he is the man you adore and wish him a Happy Father's day! This endearing Father's Day card will mean so much to your husband and will make him love you even more! It showcases a father, wife, child, and a baby, and will truly touch his heart! The Father's Day message expresses that he is an exceptional father to his children and that you are grateful to have him as your husband. So wish the father of your children a happy Father's Day today with this beautiful greeting card. This Father's Day card features an adorable image of a father and two siblings spending quality time together. It doesn't get any more special than this because family time matters most! This great Father's Day card tells him that he is the best father anyone could ever ask for! 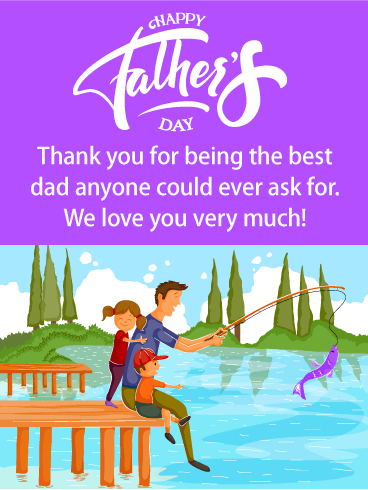 So let him know how much the two of you care by sending this special Father's Day card for his big day! Father's Day is a fantastic time to tell your husband you feel he is a great father to your children. 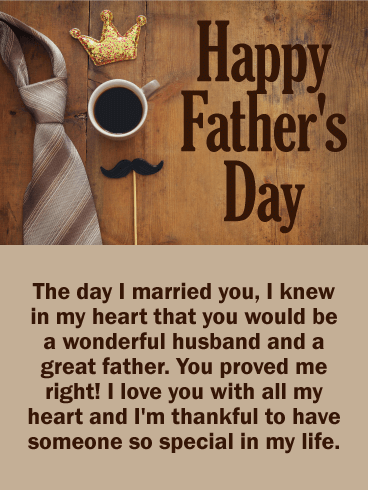 This Father's Day card expresses that the day you married your husband, you knew he would be a great father! It also includes a heart mug, gift box, and of course, a few ties! Your husband will think you are the one that is great after he receives this Father's Day card! Do you know an incredible father and want to send a special Father's Day card from the two of you? Then you are in luck! This bright Father's Day card would be perfect! It displays wonderful colors and expresses that the two of you are proud of the Father he has become to his children. 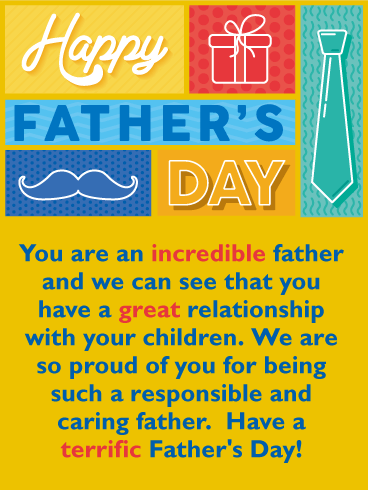 Send this Father's Day card today to let him know how you feel and to wish him a terrific Father's Day! 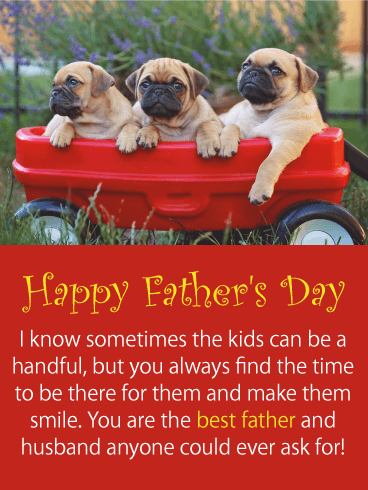 This Father's Day card is perfect if you have a few children, as you can see from the three puppies in the wagon! It's a Father's Day card that expresses your husband always makes time for his children and that he is the best father and husband. Hearing this from his wife will mean so much to him. So be sure to send these puppies to your husband to wish him a happy Father's Day today! 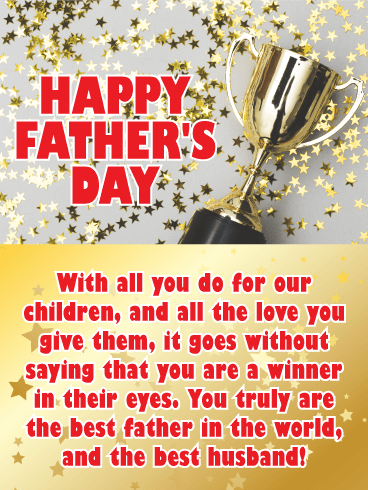 Let your husband know that he is an award-winning father with this awesome Father's Day card! It will give him a good laugh, make him smile, and touch his heart all at the same time. It showcases a gold award surrounded by stars, and says that he is a winner in his children's eyes. Let him know his wife is thinking of him this Father's Day with this fun Father's Day card!